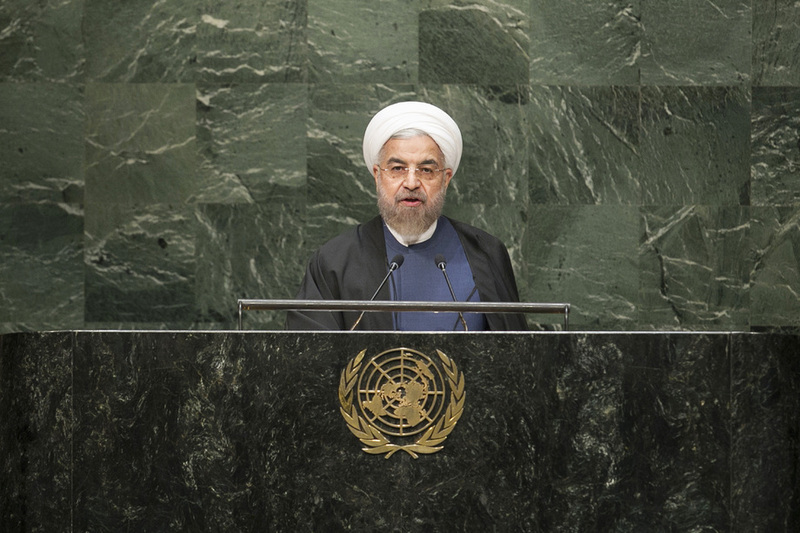 HASSAN ROUHANI, President of Iran, said he came from a region of the world whose many parts were currently burning in the fire of extremism and radicalism. To the east and west of his country, extremists threatened its neighbours and resorted to violence and bloodshed. They did not speak a "single" language nor were they of a "single" skin colour or nationality; they had come to the Middle East from around the world with a shared ideology of violence and extremism. Deeply regretful that terrorism had become globalized, he said the extremists of the world had found each other and put out the call "extremists of the world unite". To that, he asked, "But are we united against the extremists?" He said that extremism was not a regional issue that only the nations in his region would have to confront. It was a global issue that certain States had helped create and for which their peoples were paying the price. Today's anti-Westernism was the offspring of yesterday's colonialism and a reaction to yesterday's racism. To fight the underlying causes of terrorism, he emphasized that poverty, unemployment, discrimination, humiliation and injustice must be addressed, pointing out that the strategic blunders of the West in the Middle East, Central Asia and the Caucuses had turned those parts of the world into a haven for terrorists and extremists. He said his Government's policy was to work towards constructive interaction with its neighbours on the basis of mutual respect and emphasis on common interests. The notion that Iran sought to control other Muslim countries in the region was a myth fanned in recent years by an “Iranophobic” project. In that regard, his Government worked towards putting an end to delusional “Iranophobia”, setting the stage for strategic partnerships with its neighbours. If the right approach was not taken in dealing with violence and extremism, the international community would find a more turbulent and tumultuous region that would have repercussions for the rest of the world. However, while the right solution must be one with international support, it must come from within the region, he concluded.. Speaking in exercise of the right of reply, the representative of Iran responded to the issue of the Iranian islands raised by the United Arab Emirates, reiterating that his country maintained full sovereignty of the islands of Abu Musa and the Greater and Lesser Tunbs in the Persian Gulf. Iran expressed its willingness to enter into discussions on that matter with the United Arab Emirates to clarify any misunderstanding that may have occurred on the issue. Speaking in exercise of the right of reply, the representative of Iran said that the representative of the Israeli regime had made baseless accusations and distorted passages against his Government, which were designed to defend the atrocities that it had recently committed against a whole civilian population. That speaker had tried in vain to wash his hands of that most recent bloodbath in Gaza, perpetrated before the eyes of the whole world. He rushed to the General Assembly to hopelessly wage another war against the whole Islamic world and civilization, associating them baselessly with the ISIS terrorist group and propagating Iranophobia and Islamophobia. All of that was done to the applause of a crowd brought in from outside the United Nations. He said it was ironic that a regime famous for its atrocities, apartheid policies and war crimes could allow itself to accuse other countries in such a sinister way. It was also preposterous that the same regime with a highly known record of developing, producing and stockpiling different kinds of inhumane weapons, including nuclear weapons, ventured to falsely accuse others of trying to acquire similar weapons. It was "laughable" for many to hear such a person speak of the atrocities by the ISIS terrorist group when, under his command, there had been an aggression against Gaza in which all international norms and laws were blatantly flouted, leading to the killing of more than 2,000 Palestinian civilians, mostly women and children and the elderly, and rendering more than a half a million people homeless. Those people had already been living under an inhumane and suffocating Israeli blockade for eight years. Against that backdrop, he said that speaker had claimed to be concerned over the Iranian nuclear program, which was fully peaceful and under international supervision. Iran and others in the region had the right to worry about nuclear weapons in the hands of a regime that had shown, time and again, its capacity and propensity to kill. The statement by the Israeli representative was in keeping with its well-known policy to sabotage and disrupt negotiations on Iran’s nuclear programme. Turning to the statement made by the representative of Bahrain, he said the “Persian Gulf” was and had always been the historic and time-honoured toponym for the stretch of water situated between Iran and the Arabian Peninsula. Historic evidence bore testimony to that fact, and the term was also internationally recognized, including repeatedly by the United Nations.